I had hoped to explore more adventurous recipes, but since starting this blog, I've been crunched for time. I have a vendor showcase coming up for my candles, which I'm really excited about because it's my first local showcase. But my focus has been about getting ready for that rather than which new recipe I'm going to try. I've been relying on a lot of my standard veggie favorites lately, including my veggie chili. I've been making this chili recipe ever since I went veg. It's based on a recipe in one of my mom's cookbooks. (Can't remember the cookbook name at the moment; if I find out, I'll post it here.) I've modified the recipe in various ways over the years--the original recipe didn't use a 'meat' substitute, but I've been adding one in. Sometimes I'll add in a can of tomato soup. Basically, the recipe has evolved into a concoction of whatever I have on hand. Sometimes I put corn in it. Last night, I put some yellow and green peppers in it because I had some in the fridge that were going to go bad. Yet, my chili recipe does have some basic ingredients that make it into every batch, and I'll be posting my recipe over at veggieboards.com. 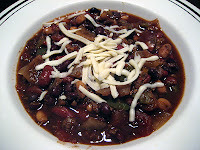 The photo featured here shows the chili topped with veggie cheese.